True leadership strength is not about doing it all yourself or being perfect. It involves building and motivating a strong bench. Delegation is an essential part of this. So is acknowledging your weaknesses. Don’t kid yourself that others are unaware of your limitations. Better to acknowledge and embrace the contributions of others. In addition, modeling collaboration and mutual reliance helps to prevent burnout and covering up mistakes. Prioritizing your own development is both a long-term investment that will likely start to pay dividends right away. Besides, working with a coach does not typically involve much of a time commitment beyond your normal work week, because most of the learning and change happens on the job – first through developing self-awareness and then by trying new approaches and behaviors. You can find 60-90 minutes for a coaching session every other week. This excuse sounds noble, and may even feed some vision of yourself as hero or martyr. However it’s healthier to cultivate a we’re-all-in-it-together attitude on your team and share the burden. But what if everyone really is maxed out? In that case, you need to take a hard look at prioritization and resources. Do you have multiple #1 priorities? Decide which really matters most and allocate resources accordingly. Ruthlessly prioritize and invest in hiring if needed. This excuse is like your wedding tuxedo – you can bring it out only for very special events, like when you’re on on a super tight timeline, or if it won’t take you more than 30 minutes. Otherwise, this pseudo-efficiency rationale often masks perfectionism or control-freak-ism. The only way to build other people’s ability is to give them work they don’t already know how to do. Guess what? You’re not really handling it. The cracks are showing. You’re not doing your best work or making your best decisions, you are taking your stress out on others, and your colleagues are getting worried and/or pissed. 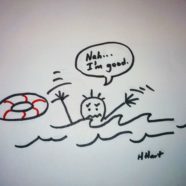 Even if you are managing to keep afloat, your approach doesn’t scale. Better to admit it sooner before you do some real damage. Climb aboard the life raft and set your course for calmer seas.